Popular trends come in many different flavors. From those designed to outrage to those that seek to unify us together, trends resonate with women for many different reasons. As part of the POPSUGAR Insights Content, Commerce, and Culture study, we surveyed over 1,500 women between the ages of 18-44 to identify the types of trends that women enjoy most. Here's what we learned. Over half of women say that they follow trends that "make them happy." 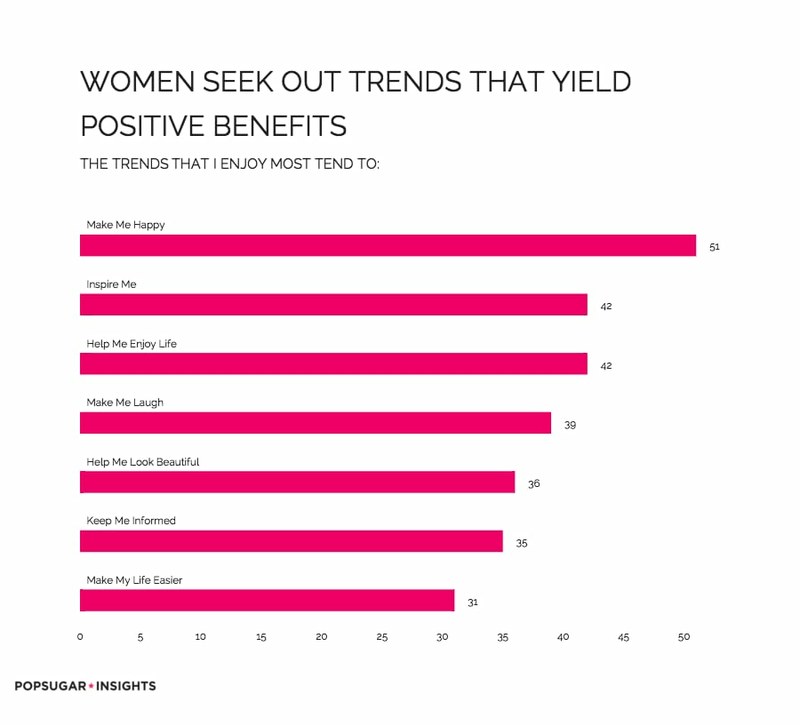 Nearly 42% of women said the trends they enjoy "inspire them" or "enjoy life" and 39% said they "make them laugh," proving that when it comes to aligning with trends, brands should seek out trends that empower and focus on positive outcomes. Thirty-six percent of women seek out trends that help them "look more beautiful," 35% seek to "stay informed," and 32% want trends to "make their lives easier." Trends like these can be seasonal, in the beauty and fashion categories for example, or can have a longer shelf life, like the rise of DIY home decorating trends. Only 15% of women said that they enjoy trends that "help them stay cool," and this ranked last overall among all response options, proving that women prefer to seek out trends that entertain, inform, and inspire over the long haul, rather than seeking out trends for the sake of the short term benefits.